"This easy, all-veggie appetizer idea is proof you don't have to make a dish, to reinvent it." Place artichoke heart halves on a paper towel cut-side down to drain for about 15 minutes. Set oven rack about 6 inches from the heat source and preheat the oven's broiler. Line a baking sheet with aluminum foil and lightly coat with vegetable oil. Place artichoke heart halves on the prepared baking sheet, cut side up. Season with salt and pepper, sprinkle with breadcrumbs and Parmigiano-Reggiano cheese, and drizzle with olive oil. Broil artichoke hearts until browned on top, about 7 minutes. Serve with lemon wedges. 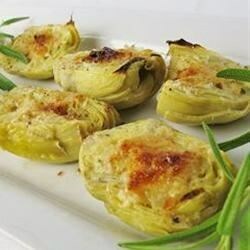 See how to make an easy artichoke hearts appetizer. This was just so-so for me. We loved this! I didn't put as much breadcrumbs or cheese as suggested just to try and cut a bit of calories, and it was still fantastic. I did use an Italian blend of cheeses. A real keeper! OMG! We LOVE this recipe. Quick and easy to make. My daughters (20, 18 & 14) were skeptical but after one taste they were big fans!! It has become one of our favorite side dishes! Very simple, cheap and yummy! Tasty and simple! I did use my own hot pepper and garlic infused olive oil which added depth of flavor. Next time I may add minced garlic and top with Asiago cheese.